Today’s $12.6 million-capped biotech has a proposition that sounds almost extravagant in its solutions. Until recently, the solution was a high-end one that was seemingly out of reach as an affordable commercial product – and still sounds more like something only celebrities have access to. High-end natural and organic skincare is only for the Gwyneth Paltrows of this world, right? If you ask today’s company, which has invested $9 million in R&D over the past eight years, the answer to that question is a resounding no. Effective natural sunscreen, and dermatological and cosmetic skincare products can be made available to a mainstream audience. 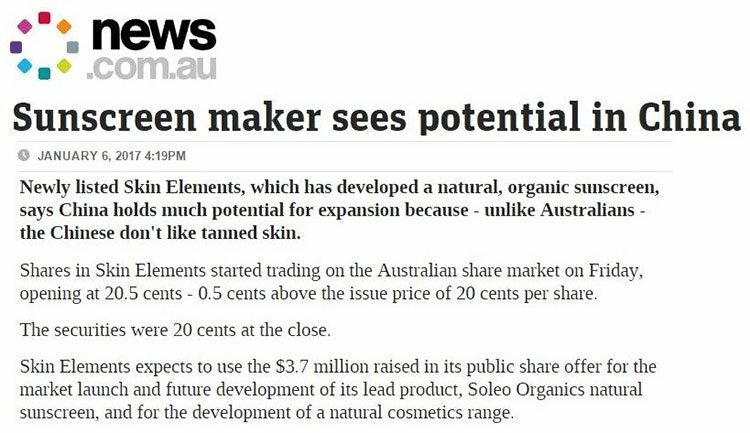 Indeed, this Australian-based developer of US FDA and Australia TGA approved natural and organic skin care products already has mainstream reach spanning over 15 countries, through its 100% natural and organic sunscreen Soleo Organics and is set to launch its organics sunscreen range into the US$10BN global suncare market. How much of this market this company can attract remains to be seen, so investors should seek professional financial advice if considering this stock for their portfolio. Sunscreen is not just a seasonable product – while it seems like a concern only for the summer months, in fact winter can be a dangerous period for the development of skin cancers. The recommendation is that a decent, non-toxic sunscreen be worn year round, making a good case for robust year round revenue, too. Importantly for this company, it has appointed leading Australian laboratory Baxter Laboratories as its preferred manufacturing partner. Baxter will be responsible for producing and packaging commercial scale quantities of Soleo for distribution into major retail markets. 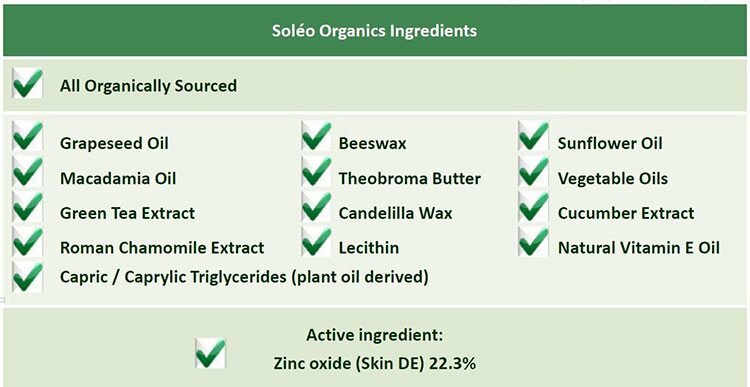 Soleo uses only organic and natural ingredients such as antioxidants, plant extracts and vitamins which are known to moisturise while providing broad spectrum sun protection. Interestingly, the company recently delivered a 20,000 tube production run of the Soleo Organics sunscreen range, with a further 20,000 to follow. A distribution agreement with Rener Health Products to distribute the Soleo Sunscreen into the WA pharmacy market could also boost production and revenue. There’s clearly growing demand for these products with evidence to say they’re safer than synthetic products, which contain petrochemicals that have been linked to all sorts of ailments spanning from allergic reactions to hormone-related cancers. Today’s company is aiming to become the number one recognised national and international sunscreen brand in a US$10BN global suncare market. Its star Organic sunscreen product, Soleo has already sold in the vicinity of 350,000 tubes under a test marketing program — previously raking in $3 million in sales, and receiving multiple international awards, from Elle Magazine , EWG (Environmental Working Group) and Sprig (Washington Post). And it happens to be EWG’s #1 rated sunscreen. And while all of that is fascinating, sunscreen is just one aspect of this company’s playbook. The second instrument being played in this progressive band is the McArthur Skincare range, as a result of the company’s acquisition of the 100% Australian-owned natural skincare company. Since 2010, McArthur has brought in $23M (the acquisition is inclusive of its extensive range of natural products for all sorts of skin conditions like psoriasis, eczema, and acne). Like the Soleo brand, McArthur has also seen a production ramp up, with a 10,000 production run just completed. The third piece is a new all-natural cosmetics line called Elizabeth Jane. A bit like the famous Elizabeth Arden, but an all-Australian and all-natural version. Test-marketing of these products has commenced, with plenty more progress in the pipeline. Finally, the company is keen to break into the Chinese market (a culture where, traditionally, tanned skin is considered highly undesirable)? Other overseas markets are also on the radar following five years overseas market testing. Not surprisingly, we are very curious about where these organic-skincare pioneers are headed and how it intends to become the number one choice for premium sunscreen. 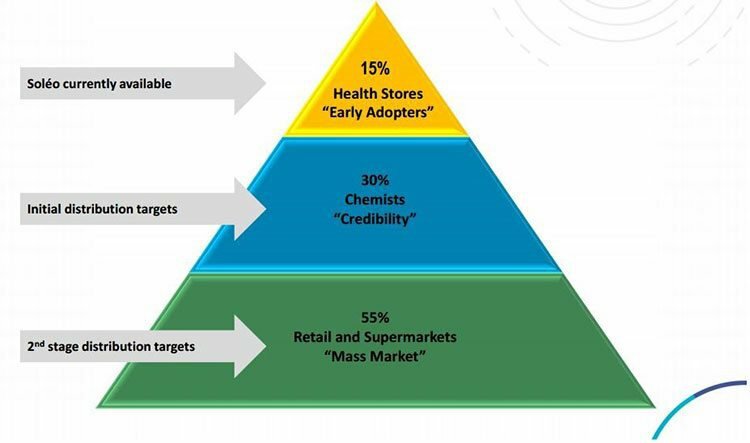 The primary thing an emerging consumer company needs is a good idea, or several ideally. This chemical free sunscreen has regulatory approval in Australia, the US, Canada, Japan and several other countries – which is a major deal considering the rigour applied to sunscreen regulations in several of these countries. Soleo is a huge aspect of SKN’s game plan, but not the sole focus. As we mentioned above, SKN has a dermatological and a cosmetics based business — with the key criterion being natural and organic products that don’t cause harm. Combine the two and you get ‘dermo-cosmetics’ – a rapidly growing industry. According to dermo-cosmetics brand Eau Thermale Avene, just the European market for dermo-cosmetics was €6.95billion in 2015 (an increase of 3.9% on 2014). If you want to predict whether this trend of ditching synthetic products in favour of natural/organic equivalents is facing a headwind or a tailwind, the percentage differences between age groups are telling. The study found ‘millennial’ women (aged 18-34) are the most likely to “spend more on all-natural beauty products in the next two years” with half of them claiming that’s what they intend to do. That age group could well represent a dominant proportion of market share, perhaps now, but even more so stretching out into the next 10, 20 and 30 years as this group gets older and potentially have a greater need for skincare products and increased buying power. The younger the age, the more interest the survey participants had in reading beauty product labels — from 52% of women aged 55-64, 59% of women aged 45-54 up to a significant 63% in the millennial age bracket (18-34). Overall, it found that six out of ten adult women in the US read the labels of their beauty products before purchasing them, looking for things like sulfates, parabens, synthetic fragrances and various additives that have been known to put the endocrine system out of balance, among other adverse effects. Particularly in the realm of manufacturing an organic sunscreen, a major step is getting regulatory approval. 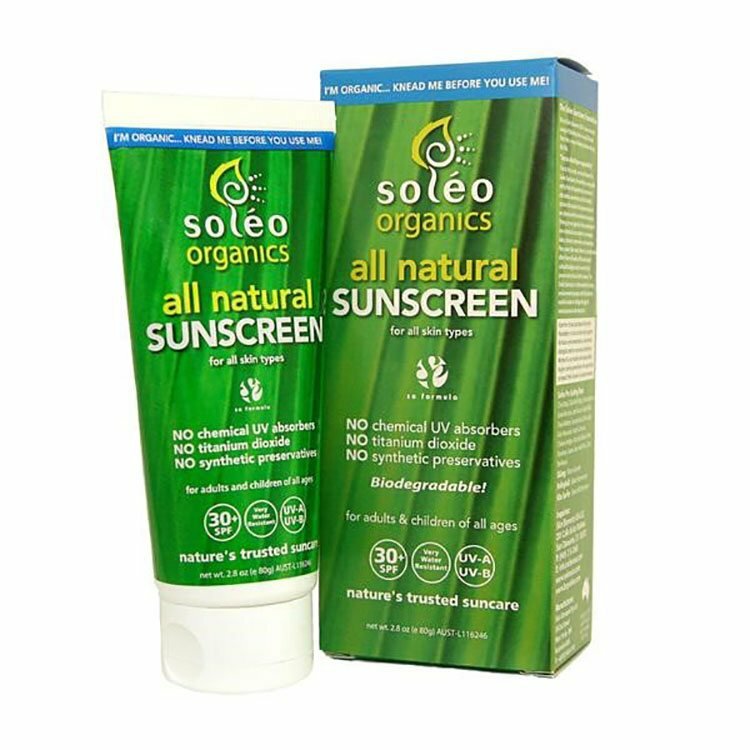 The Soleo Organics chemical free sunscreen has regulatory approval in Australia, the US, Canada, Japan and several other countries. Combine that with the fact it’s been through a successful global test marketing phase, and you’re looking at a major skincare company for the health-conscious customer. It is worth taking a moment to compare the difference between SKN’s products and those currently on the market. As you can guess from above, these are all chemicals you’ll never find in Soleo Organics products — the frontrunner product range for SKN. Basically, you could eat this stuff. Safely. Historically, SKN was a research and development company. For around ten years it was interested in developing natural sunscreen technology. Since listing on the ASX in January 2017, SKN has worked its way up to an impressive range of 29 products all organically sourced including the McArthur range. SKN completed the acquisition of the 100% Australian-owned natural skin care business McArthur Skincare in April this year, landing several TGA-approved products in the process. It has a comprehensive range of 17 natural pawpaw-based skin care products, and is due to release its products onto the market just a few short weeks from now. McArthur Skincare saw a huge rise in visibility over a five-year period, having developed a winning formula in the five years prior to that — bringing in sales totalling around $23M in the first three years. The acquisition was both highly synergistic for SKN, and value accretive with plans to increase market share, utilise McArthur’s multi-channel sales model to push the Soleo products, establish new channels and markets for the entire consolidated range — and then develop even more natural skincare products. The acquisition gave SKN now has a range of 29 different products including skin care, sun care and beauty enhancement. The acquisition is now taking effect, with revenues up 45.5% on the previous quarter, representing a record quarter for SKN to date. Of course this is a speculative stock and investors should seek professional financial advice if considering this stock for their portfolio. Combined with the $1.1 million it had in the bank at the end of the September quarter, SKN is in a solid position to meet its growth objectives moving forward. All of this is about a trend towards replacing what people (predominantly women) were using on their skin in the past — synthetic chemicals, many of which with unknown long-term effects — and replacing them with a natural or organic element instead. Do you want to know how many webpages on the internet reference natural skin care? According to Google, about 164 million . That’s how many businesses, bloggers and forums have a page about, or in some way reference, natural skin products. At the time of writing, that’s ten times the number of results (~ 15 million) that Google returns if you search for our Australian Prime Minister, Malcolm Turnbull... OK, the point is that this is a major market we’re talking about. And it’s still only in the process of fully emerging, with a very high likelihood of increasing multi-fold in the coming years. On top of the McArthur acquisition, SKN had been working hard in the background to secure a Memorandum of Understanding (MoU) with Australian, China focused health care export business Ageless Products to explore the opportunity to form a joint venture for the distribution of SNS’s range of products in China and other major global target markets. The MoU would see SKN and Ageless propose to work together to establish a 50-50 joint venture to be called Elizabeth Jane International for the purpose of utilising the specialist sales, marketing, distribution and regulatory services of Ageless to secure distribution, sales and marketing agreements for SKN’s Elizabeth Jane Natural Cosmetics skincare range, Sole and McArthur skincare products in China and throughout the world. There are 10 products in the Elizabeth Jane range, which are currently undergoing rigorous test marketing. SKN plan to exploit the fact it has distributors in more than 15 countries, and regulatory approval in key market areas including the US FDA, the TGA in Australia, Health Canada and Japan Ministry of Health. There’s also plenty of opportunity in China. The market in China is considerable, not just because of the large population, but because Chinese people are traditionally concerned with sun exposure tanning the skin — here’s an article about that and how SKN are looking to target this immense market. 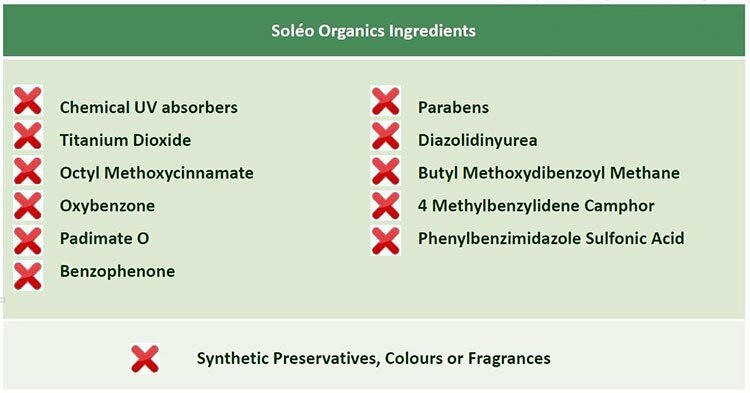 The door is wide open for Soleo Organics to enter a range of international markets, and SKN intend to make good use of that fact and build an international brand with multiple revenue streams. The company indicated it will first tackle the Australian market, before expanding to Europe, the UK, US and Asia. There is a lot of boxes to tick before SKN reaches its full expansion potential, so investors should seek professional financial advice if considering this stock for their portfolio. These are professionals who have plenty of motivation to care intensely for their bodies and their health, to the 100 th degree. Protection from illness is forefront in their minds — and they have put their names behind the Soleo story. Synthetics are on the way out and natural, food-based ingredients are in. And really, once these products become more widely available and more people become familiar with the idea, there will be no reason to go back to chemical-laden products, which have the potential to cause all sorts of health issues (not just to the individual, but for women the effects can actually be passed down to babie s before and after birth). Consider that the majority of synthetic sunscreens contain at least one chemical derived from petroleum — a substance that if we ever had to come in direct contact, a person with common sense would use gloves to avoid contamination. In cosmetics, sure it is a lower concentration — but over time, and using a product every day (for example, kids playing outside using sunscreen or women applying make-up every day) these toxic effects can compound. SKN is looking down the barrel at product launches, new geographic markets, new revenue from its acquisition of the McArthur Skincare business, and further on down the track the full development and launch of its Elizabeth Jane natural cosmetics range. The sunscreen market is huge. It’s expected to reach US$11.1 billion by 2020 . Then there’s the global beauty care market worth about US$379 billion in 2013 with projections it will reach US$461 billion by 2018 . The next one to two years should be pivotal as this newly-listed company tries to stamp its brands across three skincare sectors and across several continents — with a highly promising start pushing the Soleo Organics sunscreen product. Here’s a look at how SKN intends to enter the markets. The key aspect of SKN’s business plan is that it’s not just looking to offer products that can match synthetic equivalents, it’s looking to actually provide better efficacy outcomes for customers. Rather than “Soleo is the best non-synthetic sunscreen we have in our store”, SKN’s ideal outcome would be outlets saying “Soleo is the best sunscreen we have in store”. The company has also managed to line up free advertising across magazines, blogs and more... and plans to build up inventory, negotiate more global distribution, and create new products. Having soft launched in Japan already, and turning over $3 million in sales over five years of doing market testing in various countries, we wonder what the future could hold with a dedicated marketing strategy in full swing. We think it could have all the (Skin) Elements for success.